James Thomas Breech (born April 11, 1956 in Sacramento, California) is a former American football kicker in the National Football League, who played forOakland Raiders in 1979 and Cincinnati Bengals from 1980–1992. Before his NFL career, Breech played for the University of California and Sacramento High School. Breech was notable among kickers for wearing a different size cleat on his kicking foot. He wore a smaller size 5 cleat on his right kicking foot (his normal size was 7) which he felt gave him more control and stability kicking the football. After graduating college in 1978, Breech was selected in the 8th round of the 1978 NFL Draft by the Detroit Lions but was cut by the team before the start of the season. He spent the 1979 season with the Raiders, but they cut him in the 1980 pre-season in order to sign kicker Chris Bahr, who had just been cut by the Bengals. Breech then found himself unemployed until he received a phone call from Cleveland Browns assistant personnel director Paul Warfield, asking him to come to join the team and fill in for injured kicker Don Cockroft. However, before his scheduled visit to Cleveland, he received another phone call, this one from Bengals assistant personnel director Frank Smouse. 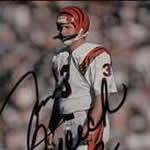 Breech decided to join the Bengals, and ended up staying there for the remainder of his career. In his 14 NFL seasons, Breech made 243 of 340 field goals (71.4%), 517 of 539 extra points (95.9%), and scored 1,246 total points. His 1,152 points with the Bengals are a franchise record. He is second all-time scoring in consecutive games with 186 consecutive games, and he was a perfect 9 for 9 inovertime field goals, an NFL record. Breech also played in Super Bowl XVI and Super Bowl XXIII, was perfect in both games, not missing a field goal or extra point in either one. In Super Bowl XXIII, he kicked 3 field goals and scored 10 of Cincinnati’s 16 points in the game. When his third field goal gave the Bengals a 16-13 lead over the San Francisco 49ers with just 3:10 left in the game, it appeared there was a strong possibility he would become the first kicker ever to win the Super Bowl MVP award. However, the 49ers ended that chance by driving 92 yards and scoring the winning touchdown with 34 seconds left in the game. His son, Daniel Breech, played professional arena football with the Cincinnati Marshals in the National Indoor Football League. Breech is currently a sales executive for the Hauser Group, an insurance firm in the Cincinnati suburb of Blue Ash, Ohio. He is also on the board of directors for Kicks for Kids, an organization to help needy kids started by fellow former Cincinnati Bengals kicker, Doug Pelfrey.